Get involved. Denim's been making a conscious shift from 'staple' to 'statement' lately. I still stand by my word that classic styles will never date, but denim with a point of difference (like frayed edges or a released hemline) is at the top of my 'TO DO' list right now. Why? Because rather than forming the basis of an outfit, it becomes the outfit - but it's still casual enough to wear over and over again. 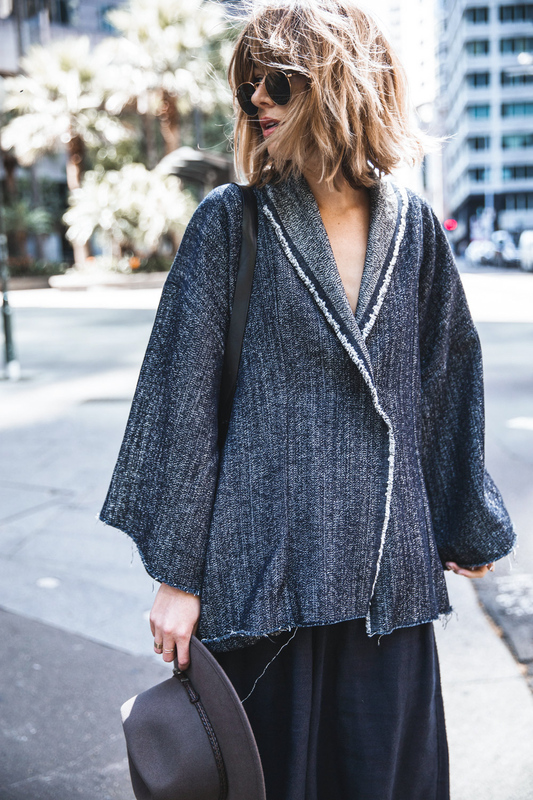 It's all about 'dem frayed edges, baby, and I'm all about this Bassike kimono-style denim jacket. It speaks to my philosophy of 'the bigger, the better' - where everything just falls like it should and nothing pulls where it shouldn't. FYI I don't intend to take it off. Ever. P.S. Incase you missed it - some of my favourite Australian designers like Bassike, Dion Lee, Scanlan Theodore and KitX are now available to shop internationally on Farfetch! Trust me, you want to get to know them. Wearing: Bassike denim jacket | Bassike pants | Plus Equals bag | Ray Ban sunglasses | Joie shoes | Akubra hat *Shot in collaboration with Farfetch.